The title War for the Planet of the Apes doesn’t paint an accurate portrait of the movie. It does indeed include large scale military operations, and there’s an intrinsic struggle for control as the human race creeps closer and closer to extinction. But the film transforms and evolves. It begins as a Vietnam War-style picture, right down to the slogans scrawled on soldier’s helmets—the opening is as harrowing a combat scene as has been put to film in years. Then the story morphs into a tale of a distraught husband and father on a self-destructive quest for revenge. And beyond that, it becomes a Great Escape-esque adventure. It’s easy to see why, if you’ve been watching, the marketing for War for the Planet of the Apes has no idea how to sell this movie. The promotion has bounced all over the place, but none of it hits what the movie is actually about. There’s war, but it’s not a war film; there’s thrilling action, but it’s not an action movie; it relies heavily on special effects and spectacle, but it tells an intimate, personal story. It’s not the movie that’s expected or one easy to pin down in a sound bite, and it rarely goes the obvious direction. Which is why the end product is so fabulous. 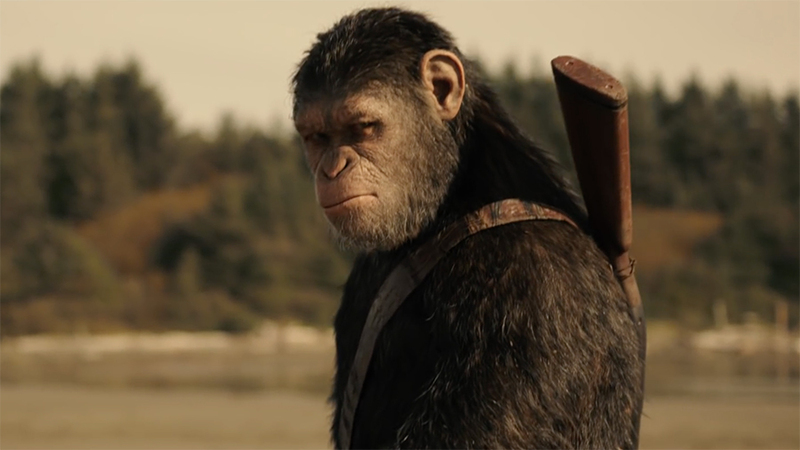 Once again, Caesar (Andy Serkis) and his cadre of Apes just want to be left alone, but spiteful humans who blame them for the Simian flu that wiped out most of humanity keep poking the metaphorical bear. Hunted by The Colonel (Woody Harrelson), Caesar suffers an unimaginable loss and seeks retribution. On the surface, it’s simple and straightforward, though the reality is anything but. Apocalypse Now presents the most obvious comparison point. 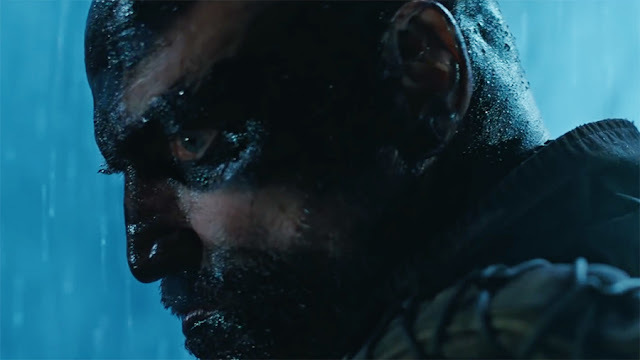 Caesar embarks on a largely solidary, near-mythic journey; with his shaved head and camouflage war-paint, not to mention his rank, Harrelson cuts a Colonel Kurtz-ian profile. Similarly, his troops are more fanatics and true-believers than rank-and-file soldiers. At one point, characters encounter the phrase Ape-pocalypse Now spray painted in a tunnel, which I like to believe the producers included to prevent jackasses like me from using that in headlines. While the narrative begins as an examination of the high individual cost of revenge, Caesar, always driven by a sense of duty to his people and those who depend on him, changes direction. And once again, he sets personal drive aside to do what’s best for the Apes. 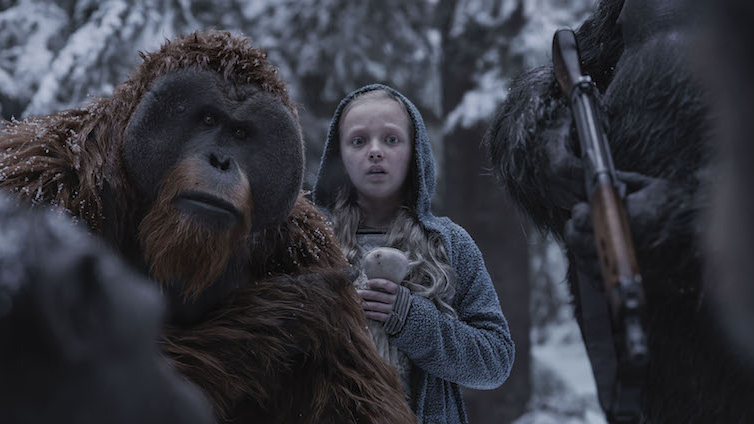 Written by director Matt Reeves and Mark Bomback, War for the Planet of the Apes truly explores one character’s journey, which is both its greatest strength and weakness. War is Caesar’s movie, plain and simple, and Andy Serkis delivers another phenomenal performance. Wrapped in digital layers, he carries the story with subtlety, gradation, and incredible attention to detail. He’s such a compelling protagonist, with a complex arc and moral composition, it’s easy to gloss over that fact that none of the supporting players have anything to do, even though they’re set up to be much more. 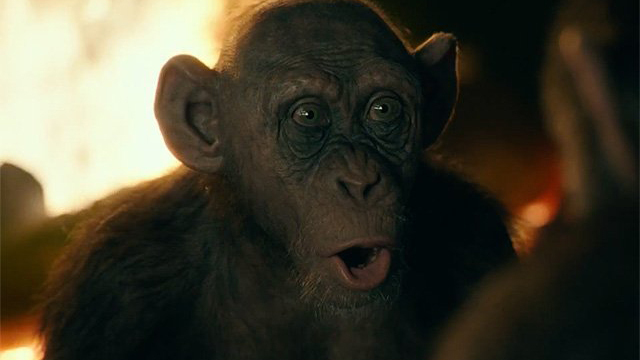 Steve Zahn’s Bad Ape is the most notable addition to the Ape family. He essentially fills the role of an old, unhinged coot from a classic western, a demented wing-nut tagalong. Obviously traumatized and warped by his experiences, he has a sad, tragic backstory, but one that’s only hinted at obliquely and touched on for a brief moment. Amiah Miller’s Nova suffers a similar fate. A mute human stray picked up along the road, she’s delightful and moving and provides an otherwise absent emotional vantage point—she more or less becomes another Ape in the pack, which could have been an interesting angle to explore. But only when she’s on screen. Which isn’t often. Both of these characters feel like they had bigger roles in the script, but were trimmed down, resulting in them being underutilized. 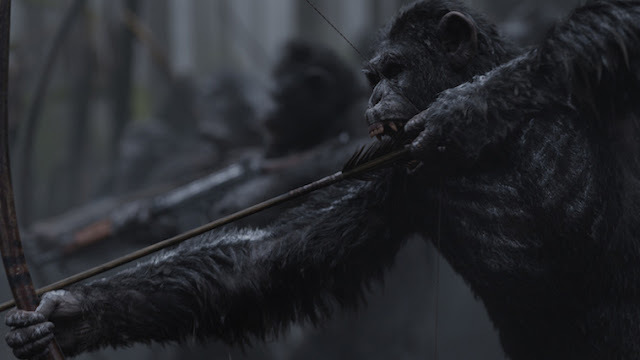 The special effects are flawless and so integrated into the onscreen action it’s easy to take them for granted—especially three chapters deep into the franchise, you scarcely notice the Apes aren’t real. Ape faces prove so emotive and realistic that their existence is never in doubt; instead of seeing meticulously arranged pixels, the audience simply sees seamless characters delivering emotionally rich, textured performances. The digital work is breathtaking in effect and execution, which is vital to the film as there’s almost no human element. While the previous films revolve around Caesar and the Apes, there’s always been a significant human component. Sure the Colonel and his men are human, but their fanaticism only goes so deep and there’s little more to them than that. Nova is the lone good human character. War for the Planet of the Apes spends the bulk of its time on the Apes, and rightly so, but without the impeccable special effects, it’s difficult if not impossible to pull off the gravity and profundity the film achieves. 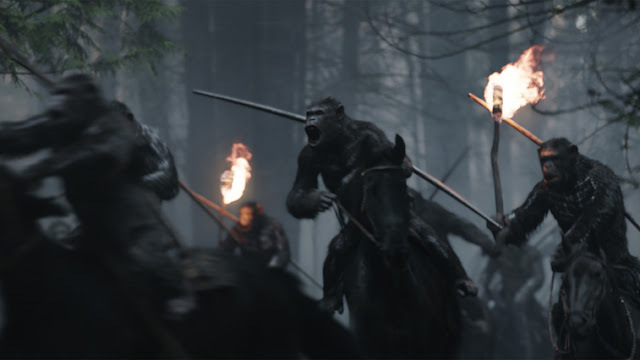 For a movie with the word “war” in the title, War for the Planet of the Apes features relatively little armed conflict—Dawn of the Planet of the Apes has exponentially more combat, while this becomes a more metaphorical war, a war for the soul of the Planet. It dives deep into a bleak, pessimistic view of a crumbling society that gives it an uncomfortably prescient edge.